I was super surprised at how much I liked these. My expectations were low. They look like crackers. Yesterday, I had waffles and sausage. I couldn't imagine feeling satisfied from a packet of four crackers. I was wrong. To characterize these breakfast biscuits as crackers or cookies is wrong. The variety I tried was blueberry. 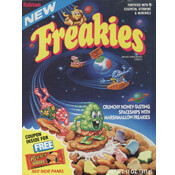 As I took my first couple of bites, I scanned my breakfast memory to figure out what this product reminded me of. It was blueberry pancakes. Do you remember the scene in Willy Wonka & the Chocolate Factory where Violet Beauregarde chews a piece of gum and gets all the flavors of a three-course meal. It's almost that startling. If you concentrate on the flavors in your mouth, it's like starting with blueberry pancakes, having a blueberry scone and then finishing with a blueberry oatmeal cookie. So, it's clear I love the flavor. But can these modest sized biscuits fill you up? A serving consists of 1 pouch which contains 4 biscuits. By the third biscuit, I was starting to feel full. I reread the package to see if I was really entitled to another biscuit. By the end of the serving, I was genuinely full... I mean, I felt like I overate. I stayed full and satisfied for the next 4 hours. With much surprise, I enthusiastically recommend this product. Nutritional Considerations: Each 4 biscuit serving has 230 calories, 9 grams total fat (2 grams saturated and 0 trans), 0mg cholesterol, 170mg sodium, 33 grams total carbs, 4 grams dietary fiber, 12 grams sugar and 5 grams protein. "The most important meal of the day just got better! We believe a great day starts with a great breakfast, that's why we are proud to bring you Breakfast Biscuits by Nature Valley. Each biscuit has a delicious crispy texture and the goodness of 100% natural whole grain oats. With 26g of whole grains per serving, they provide nutritious long-lasting energy to help keep you going." 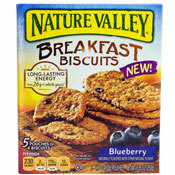 What do you think of Nature Valley Breakfast Biscuits? Huge hit for me! I don't usually have time for breakfast before leaving for work. These are perfect for mid-morning or afternoon snack. I was loving the Lemon Poppy Seed kind. My Kroger's discontinued them! Why?! They are delicious. These biscuits are wonderful. I absolutely adore the lemon poppy seed and was dismayed to see there wasn't a spot for them on the shelf at the store today. I hope they haven't stopped making this flavor. Not so sweet, very tasty. I'm used to having graham crackers every morning with my coffee, now I enjoy my breakfast biscuits. The blueberry are my favorite. How about raspberry flavor? I love these breakfast biscuits. Tried the lemon poppy seed and the honey ones but the blueberry is my favorite. Have a pack every morning for breakfast. One pack is very filling and I don't get hungry before lunch. Thanks for a great product. I am addicted. Very filling and fresh tasting. Lots of flavor. I like the blueberry ones. Sadly, the lemon poppy seed ones are terrible. I love all the flavors. Quick breakfast while I read the paper. So unexpectedly good. The honey flavor also reminds me of graham crackers. Highly recommend. They need to tone down overwhelming blueberry flavor. I suspect it comes from the 'natural flavors' ingredient because I don't think a few pieces of dried blueberries can do that. It doesn't come off as a natural flavor like eating a handful of blueberries but rather the 'blue flavor' of a blue berry-flavored Popsicle. And the bar's berry flavor sticks to your mouth, like an oily sheen. Other than the fake blueberry flavor these aren't bad, which is why I'm so disappointed in the fakey blueberry flavor. Oh my gosh! I absolutely love these breakfast biscuits! I got the honey and the blueberry ones. I have not tried the other ones yet, but I am in love with the honey ones! 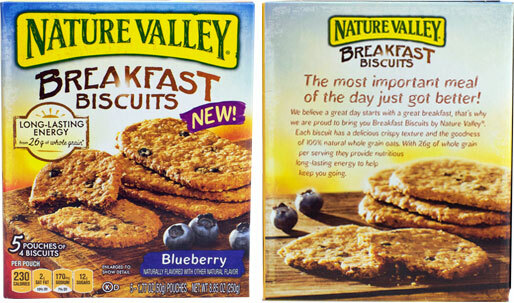 Thank you so much for these great breakfast biscuits Nature Valley! These are so good! I break them up and put them in my yogurt. I really am not wild over BelVita. I am hoping these are softer.